Thursday, June 19: Arrive (morning) in England, go to the George Hotel in Lichfield. Friday through Sunday: Lichfield Folk Festival (Scott Higgs, Gary Roodman plus great British callers). Click for photos from 2006 Yanks Meet Limeys at Lichfield. Monday June 23: Day: A 4hr trip on a traditional "Narrowboat" on the Birmingham canal. This is a fascinating experience - you get a completely different view of a city from the canals that once serviced its industries. We will start in the very center of Birmingham at the Gas Street Basin and travel behind and beneath the city, parts of which haven't changed since Dickens' time. We have been promised some countryside too and will be able to glimpse suburban life from its back gardens. Best of all we get to work the locks along our route - the ingenuity of the Victorians who built the whole system is truly marvelous. In the evening we will probably go to Loughborough FDClub dance, Scott Higgs calling. 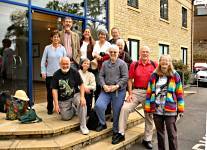 Tuesday June 24: Morning: transfer to Emsley and Ambleside Guest Houses in Stratford-upon-Avon. Afternoon: free time to acquaint yourself with Stratford-upon-Avon. Although famous for being Bill Shakespeare's hometown, it is far less spoilt than one might fear. It has a plethora of lovely ancient houses and sites to visit. You can sit beside the river Avon and watch the swans, or you can help the gaily painted narrowboats (barges) work the lock gates at the start of the canal. Wednesday June 25: All Day: Visit Blenheim Palace and gardens; Evening, Dance. Thursday June 26: Visit Warwick Castle; "the finest mediaeval castle in Britain". Dance at the Milverton FDC. 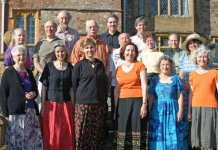 Friday June 27: Transfer to Halsway Manor in the Quantock hills for "Pat Shaw & Beyond" Weekend. Monday, June 30: return to airport for flight to U.S. The exact places we go to will depend partly on who we find to guide our walks and partly on who decides to come on the trips. We wouldn't want too many people to go to places they have been to before. And we are always open to suggestions! Click here for some details of our tour in June 2006.